Arctic Frontiers — Norway’s largest gathering on Arctic affairs — started in Tromsø on Monday. Opening remarks were delivered in the same way as last year and the years before that, but this year without the president of the Sami Parliament on the shortlist. “We feel downgraded. We are in the Arctic and we are peoples of the Arctic. They should have included us on the list of speakers as they have done before,” says President Vibeke Larsen. “I think we could interpret this as downgrading indigenous peoples. Looks like we are less important,” Larsen told the Independent Barents Observer after the opening sessions in Tromsø. Prime Minister Erna Solberg, Chairman of Arctic Frontiers steering committee Salve Dahle and Rector of Norway’s Arctic University Anne Husebekk had short introductions followed by an hour and a half with a 10 person long list of introductions and an armchair Arctic debate on climate change, blue economy, politics and high north science. In addition to Solberg was Finland’s Prime Minister Juha Sipilä, Sweden’s Foreign Minister Margot Wallström. Foreign Minister of Iceland Guðlaugur Þór Þórðarson, Director of the Earth institute at Columbia University Jeffrey Sachs, Russia’s Arctic Ambassador Vladimir Barbin, Environmental activist Ingrid Skjoldvær, Denmark’s Minister of Equal Opportunities and Nordic Cooperation Karen Ellemann and Petteri Taalas, Secretary General of the World Meteorological Organisation. Ole Øvretveit, Conference Manager of the Arctic Frontiers secretariat says it all has to do with changing focus. “We had to compress the program and limit the ceremonial part,” Øvretveit explains. 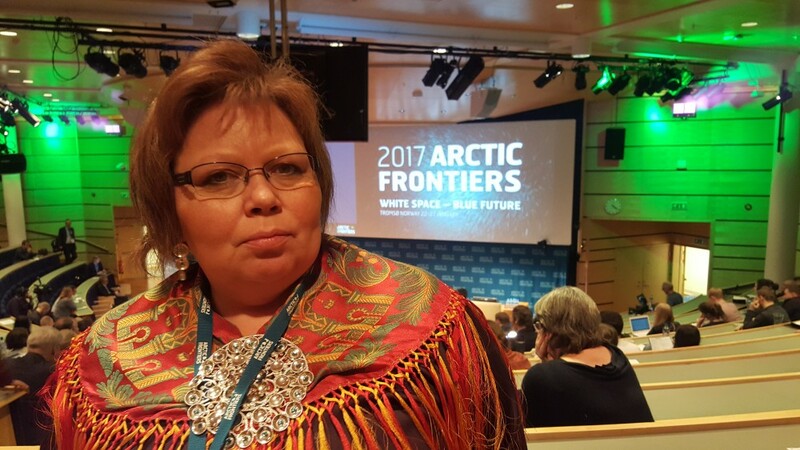 Aili Keskitalo, former President of the Sami Parliament and keynote speaker at last year’s Arctic Frontiers conference, says it is of vital importance that Sami issues are voiced at venues like the Arctic Frontiers. “We are talking visibility and recognition,” Keskitalo says when asked why being disappointed that the organizers of Arctic Frontiers this year didn’t gave the floor to a Sami voice at the opening. “I am disappointed that you ditched the Sami Parliament from the high-profile opening of Arctic Frontiers. That is a harsh signal,” Aili Kesikitalo said in a tweet directed to the organizers. Last year, when president, Kesikitalo told the audience at Arctic Frontiers that a new leadership is needed in the debate on extraction of natural resources in the high north. Gunn-Britt Ritter, head of the Arctic and Environment Unit with the Sami Council says what happened in Tromsø reveals a view on Arctic issues that is not in line with the indigenous peoples’ interests. “They name the conference Blue Future, but they don’t let the people fishing along the coast be heard. They discuss how to land oil and gas from the sea, but not the need to land fish. Maybe the organizers doesn’t want to hear the substance of Arctic life,” Ritter asks. She says it is strange that the Sami President couldn’t get the floor at such high-profile opening. “We are the people living here and when guests from all around the world now comes to Tromsø to learn about life in the Arctic, it would of course be obvious that Sami voices should be during the opening. Ole Øvretveit says the Sami Parliament is included in the program for Wednesday. President Larsen hopes to be included next year. Øvretveit tells that the organizers are in dialogue with the Sami Parliament, also regarding next year’s program.